Interior Features: laptop sleeves, organizer pocket, large compartment. Capacity: stationery, A4 books, kettle, mobile phones, IPAD. Size: 12.6"*5.5"*16.5"/32cm *14cm*42cm(length * width * height) Exterior Features:1 * main pouch, 1*front zipper pouch, 2*side water bottle pocket, 1*interlayer pouch, 1*interior zipper pocket, full support back panel and padded shoulder straps. Interior Features: laptop sleeves(can hold up to a 14in laptop), organizer pocket, large compartment. Capacity: stationery, A4 books, kettle, mobile phones, IPAD. 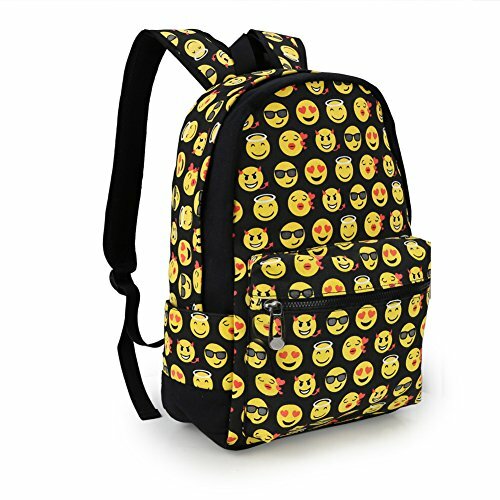 Top carry handle with small pocket on top for sunglasses or other small essentials The iconic design is a top trend that will catch everyone's eyes.Large capacity, suitable for school, weekend out, travelling, or casual daily use, definely a must-have backpack! !